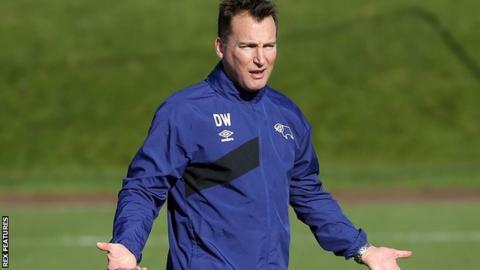 New Derby County head coach Darren Wassall says he would be a "fool" not to want the job on a long-term basis. The 47-year-old has stepped up from his role as academy director until the end of the season following Paul Clement's sacking on Monday. Wassall told BBC Radio Derby: "It's a massive privilege to take charge of the first team for the next 16 games. "It's a brilliant opportunity, working at a brilliant club with brilliant players and brilliant people." Wassall, who played for the Rams between 1992 and 1997 and has spent the last seven years on the coaching staff, added: "Anybody would be a fool not to want this job. "Outside the Premier League there are not many better clubs, probably in the Premier League there are not many better clubs. Every man and his dog would want that job." Wassall has been told his job at the academy is safe but he is eager to prove he deserves to stay in the head coach role beyond the end of the season. "I have nothing to lose," Wassall added. "I have been here seven years and have a great job and have another one now. It's a really exciting prospect. "I have been told I am completely in charge of first-team affairs and we have to do the very best we can. "We believe we have great players - we know we have. We are in a great position in the league and will give it our best shot. "The application, desire, workrate and ability has shone though in training and I couldn't have been more delighted." Chairman Mel Morris referred to the need to play in the "Derby way" in the statement that followed Clement's sacking. "The Derby way is simple," Wassall said. "We want to be hard to beat and make the iPro in to a fortress, but we also want to try to play attractive football and score lots of goals. That's easier said than done. "I will manage the team how I want to manage the team. "I will do it my way. We are in great position. I will not try to be different to anybody else; I will just do it my way." The strangest sacking of the season? Read more on Paul Clement leaves Derby: Is his sacking the strangest this season?